As part of a Blog Tour organized by Great Escapes Virtual Book Tours, I am pleased to have Cathy Ace as my guest today as she tells us about her choice of settings for her Cait Morgan Mysteries, which include her latest release – The Corpse with the Ruby Lips. Thanks for having me along today, and for offering me the chance to talk about something that resonates with me…the settings of my books. When I started writing the Cait Morgan Mysteries I was keen to avoid “Cabot Cove Syndrome” – you know what I mean…the fact that all the tales take place in a backwater town or village where the body-count is on a par with a major urban center, and anyone who makes the mistake of visiting reduces their life expectancy to about twenty pages. Of course, by making my sleuth travel to a different country for each book I’ve given her another problem to face – that of being viewed as some sort of “Typhoid Mary” where people drop dead within minutes of her arrival. But, when writing a series of mysteries, one has to make a decision about which path to take, and hen all you can do is hope one’s readers are prepared to take the trip you plan for them, suspending disbelief as required. That said, I do think that communicating the truths about a location – once a location is decided upon – need to be adhered to, and place offers a host of opportunities for the mystery writer. Cait Morgan was in Nice, on the Cote d’Azur, in her first adventure, THE CORPSE WITH THE SILVER TONGUE, and the puzzling mystery she faced there could not have taken place anywhere other than in the building and the city in which it was set – the building having once been Gestapo HQ during the Vichy years, and the city being one blessed with Roman ruins, ancient artefacts, and, now, a dazzling array of glamorous and moneyed residents. Similarly, British Columbia’s wine country was the perfect setting for THE CORPSE WITH THE GOLDEN NOSE, which focused on the possible suicide of a world-famous vintner and the chefs, restaurants, B&B’s and locally powerful (and decidedly odd) people who choose to live on the banks of a lake rumored to have its own “Ogopogo” monster. When I decided to take Cait to the Pacific coast of Mexico in THE CORPSE WITH THE EMERALD THUMB, I didn’t want to focus on the drug problems in the area, but on the people who live their lives there trying to avoid such issues – they are more concerned with the amount of water all the holidaymakers use and how that impacts their ability to grow crops, which was something Cait became aware of during the course of her inquiries, where she had to race the clock to save her beloved Bud from being locked away in a federal prison. And I followed this desire to show the part of a place that might not be the first thing that comes to mind in my fourth book, THE CORPSE WITH THE PLATINUM HAIR. Set in a fictional casino in Las Vegas, I knew many of my readers – even those who had never walked The Strip – would have a pretty clear idea of what Vegas is all about, but I wanted to take them behind the gilded curtains and give them a glimpse of what it’s like to be an insider there, not someone just swinging through for a long weekend. In each of my books I like to set the scene for tensions to flare between those who have been born and raised in a locale, those who have moved to live there – sometimes decades earlier – but who will always be viewed as “incomers’, those who moved to an area because of the way it was when they first saw it…then do everything they can to change it, and those who are – like Cait – just passing through. She’s always an outsider, even when I took her back to her homeland of Wales in THE CORPSE WITH THE SAPPHIRE EYES, where she discovered that home might be where the heart is, but home can change a great deal when you’ve been away from it for some time. The Hawai’ian Islands are beautiful, each in their own way, as are the luxury cruise-ships which traverse the ocean there, and I tried, in THE CORPSE WITH THE DIAMOND HAND, to convey both the sense of the beauty and open-air life of the Islands, as well as the feeling of confinement that can creep over a person when they are trapped on a ship knowing a killer is on the loose. Two of the most complex locations I’ve worked with are those in my two most recent books: in THE CORPSE WITH THE GARNET FACE, I set the story in Amsterdam, a city I know well, but which has so many layers beneath that which the normal tourist sees – or expects – that I felt the need to take Cait and the tale beyond the confines of this city filled with art, canals and world-famous architecture and out to the coast where there are delightful beaches, and into the areas where the tulips are grown…but during the heat of summer, when the fields are bare and the huge skies meeting the distant, flat horizon can feel truly oppressive. And so to Budapest for THE CORPSE WITH THE RUBY LIPS. I’ve been fortunate to spend a good deal of time in Budapest over the years, and I came to love the city which pulses on both sides of the majestic Danube. I learned that every single visitor – at some point – will find themselves humming the tune they keep telling themselves to not hum! (You can hear it now, can’t you?) The people in Budapest are quite amazing – they’ve lived, in many cases, through an almost unbelievable history, beneath the boot of first the Nazis and then the Communist Party. Residents over the age of thirty all know what it is to walk the streets unable to say what they really think aloud; those of my age knew only that condition for half their lives, and those who are older? They are still getting used to being able to do and say what they truly want to, and it makes many of them uncomfortable. There’s a tension in the city that comes from those old wounds, because, amongst the fabulous architecture and deep roots of history, the youngsters who have only ever known a free life do as they will without question…which can create problems. Yes, when it comes to choosing settings for the Cait Morgan Mysteries, I’m glad I decided she should travel to places I know well, and encounter mysteries wrapped up in their location, because I’ve enjoyed “revisiting” those places in the pages of my books, and I hope you enjoy your armchair travels with Cait. Quirky criminology professor Cait Morgan is invited to be a guest lecturer at a Budapest university, and although she’s hesitant to go without her husband and trusted sidekick, Bud, who must stay home to care for his aging parents, she decides to make the month-long trip on her own. Soon after arriving, one of her new students, Zsofia, pleads with Cait to help her uncover any clues about her grandmother’s unsolved murder, which happened decades ago on the campus of Cait’s own home university in Canada. Cait agrees, but when she is repeatedly hassled by an creepy colleague, and as bizarre details about Zsofia’s family members come to light, Cait is beset by uncertainty. As she gets closer to the truth, Cait’s investigation puts the powers-that-be on high alert, and her instincts tell her she’s in grave danger. Bud races to Budapest to come to Cait’s side, but will it be too late? Click here to enter a Rafflecopter giveaway for a chance to win a signed copy of the Corpse with the Ruby Lips. 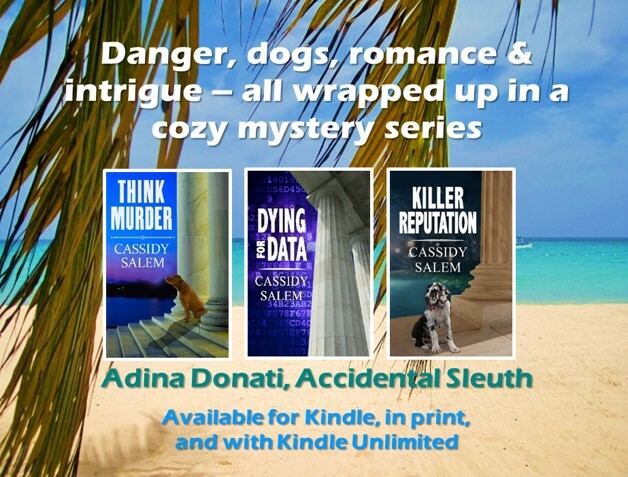 With a successful career in marketing having given her the chance to write training courses and textbooks, Cathy has now finally turned her attention to her real passion: crime fiction. Her short stories have appeared in multiple anthologies. Two of her works, “Dear George” and “Domestic Violence”, have also been produced by Jarvis & Ayres Productions as “Afternoon Reading” broadcasts for BBC Radio 4. Cathy now writes two series of traditional mysteries: The Cait Morgan Mysteries (TouchWood Editions) and The WISE Enquiries Agency Mysteries (Severn House Publishers). Cathy is proud to be Chair of Crime Writers of Canada, a member of Sisters in Crime, the Crime Writers Association, and Mystery Writers of America. Cathay Ace is a new author to me and “The Corpse With the Ruby Lips” sounds like an amazing read. Sounds good to me, too. Thanks for stopping by.. The reviews on this blog reflect my opinions after having personally read those books. In any instance where an author has provided a copy for reviewing purposes, this is clearly indicated in the respective blog post and does not influence my opinions as expressed in my review. Links to external sites are provided for the readers’ convenience only. I do not derive any financial benefit from the inclusion of such links.